The King James Bible is not merely another translation. Its history is one of the most fascinating chapters of church history and reads almost like a novel. This book traces this glorious heritage, beginning with the Wycliffe Bible of the 14th century. 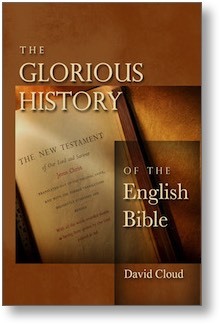 Every English-speaking believer should know this history; yet, sadly, even in the staunchest Bible-believing churches it is rare to find someone who is informed about the great price that was paid to provide us with an excellent Bible in our own language. Chapters include the Wycliffe Bible (1380), the Tyndale New Testament (1526), the Coverdale Bible (1535), the Matthew’s Bible (1537), the Great Bible (1539), the Geneva Bible (1557), the Bishops Bible (1568), and the King James Bible (1611). Under the section on the KJV we look at the spiritual and literary and scholarly climate of that day, the amazing translation process itself, the peerless translators, the nature of the translation, Tyndale’s influence, and the KJV’s worldwide influence. We also answer the following questions: Was King James a homosexual? Hasn’t the KJV been revised and updated in thousands of places? Could the KJV be revised again? Is the King James Bible inspired? Isn’t the KJV too antiquated and difficult to read? The author has studied this history diligently. He has a massive private library of materials on this subject dating back to the 16th century and has researched the subject in many parts of the world, including England, Wales, the Netherlands, Germany, Switzerland, and Italy. This book contains 41 pictures, illustrations, and drawings. Book: Softcover, 245 pages, 5.5x8.5 in. eBook: PDF, mobi (Kindle), and ePub formats. Select eBook format in cart. For your order to be charged in Canadian funds and to ship within Canada, please place your order by phone. Call toll free 1-866-295-4143. Note that all cart orders process in US dollars and ship from the USA. - Items ship from Port Huron, MI. USA. - Cart accepts Visa, Master Card, Discover, AmEx, PayPal. - Shipping is real time USPS lookup base on weight. - International customers: Call or use cart. - No refunds. Defective material will be replaced. - Orders typically ship in 3-4 days. - Your order will typically arrive in 2-3 weeks. - Customer is responsible for backups. - We cannot guarantee file replacement.